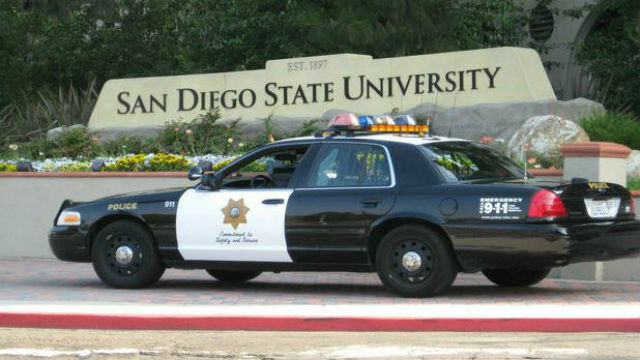 Ex-SDSU Student Charged in String of Fires Near Campus. A former San Diego State University student accused of setting a string of fires around the campus over the course of three days was charged with a dozen felony counts Wednesday, including burglary, arson and vandalism. Madelyn Delarosa, 19, was taken into custody Saturday morning, following four fires she’s suspected of setting to apartments and vehicles across campus between March 13-16. No injuries were reported in connection with the fires, all of which occurred a few blocks south of Viejas Arena. However, Deputy District Attorney Rikole Santin noted that one of the fires was ignited in an occupied apartment, inside which a person was sleeping. Santin said the heat from the flames caused a window to shatter and “rain glass and fire” upon the victim, who was asleep just below the window. A suspected motive for the spree was unknown, as was the reason Delarosa was no longer a student at the campus. Delarosa, who pleaded not guilty, faces 13 years in state prison if convicted as charged. At 11 a.m. Thursday, an officer on patrol spotted and quickly extinguished a fire in a parked car in the 5500 block of Hardy Avenue, according to campus police. Santin said surveillance footage captured the defendant entering a parking garage, where a Toyota Prius was set aflame, then an hour later, she allegedly ignited the exterior door of an unoccupied apartment in the 5600 block of Hardy Avenue, both times by using an unspecified accelerant. A passerby put out the apartment fire before officers arrived, police said. Around 8:30 a.m. Friday, police received word of the apartment blaze near the 5500 block of Montezuma Road, where the sleeping resident was able to escape without injury, according to Santin. That fire went out on its own, police said. Delarosa is also accused with setting a Mercedes-Benz on fire shortly after 8 a.m. Saturday in a parking garage in the 5500 block of Hardy Avenue. Delarosa has no prior criminal history, but had “numerous prior contacts with law enforcement,” according to Santin, the nature of which was not disclosed. The defendant is being held in lieu of $450,000 bail and is due back in court March 29 for a readiness conference.